There are26 bones thatform the vertebral column. It helps to protect the spinal cord from injury and also helps in the m0vement of our body. The intervertabral discs present in between the vertebrae acts as shock absorber. Vertebral column bears the weight of the upper half of our body. The vertebral column extends downwards from the occipital bone of the skull. It consists of 24 separate vertebrae, a sacrum and a coccyx. Body: It IS the broad, hard bony structure of the vertebra. The size of the body varies according to its site. The size of the body is smallest in the cervical region and larger towards the lumbar vertebrae. Posterior to the body, there is vertebral foramen. Vertebral Arch: It can also be termed as neural arch and is formed posterior to the body of vertebra. It is formed by laminae and pedicles of the vertebra. It encloses the vertebral foramen that contains the spinal cord. Pedicles form the lateral wall of vertebral foramen and laminae form the posterior wall of vertebral foramen. Transverse process is the bony prominence present laterally where the pedicle meets the laminae. Laminae meets posteriorly to form spinous process. There are seven cervical vertebrae. They form the bones of the neck and are the smallest among the vertebrae. The first cervical vertebra is called atlas. The atlas articulates superiorly with occipital bone. The second cervical vertebra is known as axis. The odontoid process or dens of the axis fits with the atlas. The transverse ligament helps to keep the odontoid process of axis attached to atlas. This arrange. ment helps the head to turn side to side. 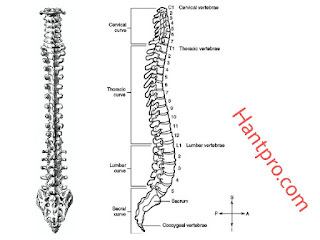 The seventh cervical vertebra is also known as vertebral prominens. All cervical vertebrae have transverse foramen on its transverse process for the vertebral artery to pass upwards to the brain. There are twelve thoracic vertebrae. They are larger thanthe cervical vertebrae. it has articulation to 12 pairs of ribs. Its bodies and transverse processes have facets for articulation with the ribs. vertebral column and it articulate inferiorly with the sacrum. protrudes into the pelvic cavity. 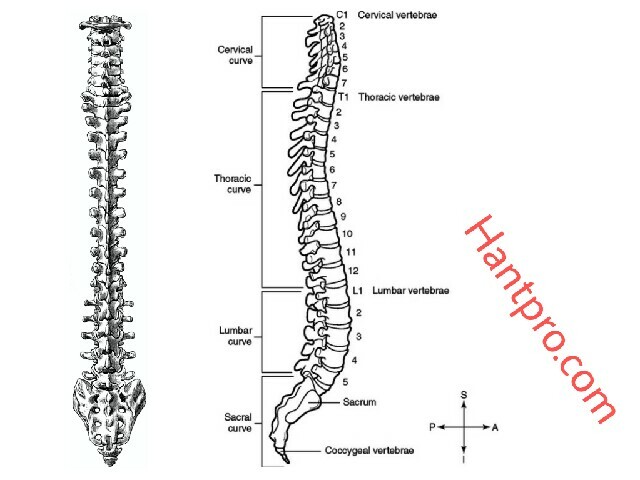 it is the last part Of vertebral column and is formed of four fused vertebrae. It is triangular in shape. It articulates with the sacrum superiorly.